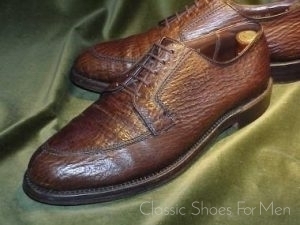 This is an exceptional example of a pre-Goodyear, pre-WWI shoe, with hand sewn channeled welt, scalloped pinking, square and diamond cut brogueing, the precursor to our modern shoe and a museum piece. 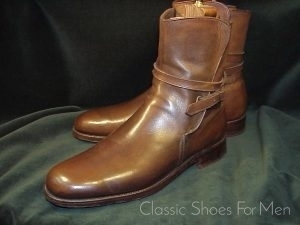 The Burt and Packard Company began in 1857 and by 1927, by then called the Field and Flint Company, their Footjoy model golf shoe became the official golf shoe of the American Ryder Cup team. 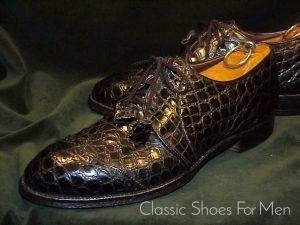 In 1957, the company was sold to the Tarlow and Stone families who in 1970 adopted the name of their premier product as their company name, FootJoy, Inc. FootJoy, the last shoe manufacturer in Brockton, a town once know as a bastion of the industry, operated there until their plant closure in 2009, ending with it the town’s 198 year shoe industry. US 7D....Continental 39D, for the medium width foot. With the exception of a blemish on one toe, in new condition.